I’ve appreciated the discussion taking place over the last few days regarding SAMR, and am impressed with the variety of opinions and pressures resulting from varied local implementations. Stop the SAMR madness. Wow. Because my district has yet to “shove SAMR” down teachers’ throats, I didn’t realize how invested so many others are in advancing poor pedagogy for the sake of technology integration. 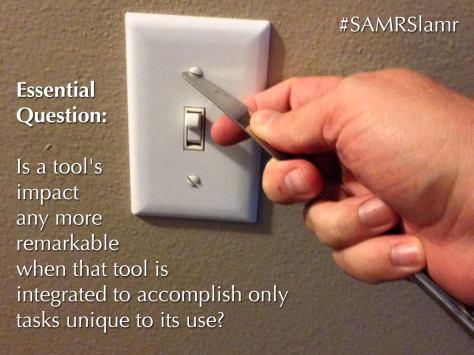 The very purpose of my last post was to spell out why SAMR doesn’t work for me. To be clear, it’s not that SAMR is a faulty model, per se. The malpractice, to me, exists in the misguided directions some educators take when using SAMR to make instructional decisions. I think folks are intoxicated with clever and colorful charts that seem to point them toward the next best thing. A lot of the learning innovation I see doesn’t always build on a foundation but rather replaces it. We are in a hurry up culture everywhere and in education, it is no different. Given technology’s role as an indiscriminate amplifier of both healthy and unhealthy instructional practices, we must tread more responsibly. Fancy models and tomorrow’s infographic must not distract us from our primary objective: to teach better today than we did yesterday.1 With effective pedagogy predominantly in mind, I continue to affirm that there are distinct times when it’s quite appropriate for teachers to function at every level of SAMR; depending, of course, on the learning goals at hand. Blindly climbing the SAMR ladder is hardly a worthy goal. Is a tool’s impact any more remarkable when that tool is integrated to accomplish only tasks unique to its use? I know I was sure happy to get that light-switch cover off (pictured below), even though some would argue I should have been buttering bread, instead. #SAMRSlamr: For use with those insistent that SAMR is an appropriate instrument when evaluating the effectiveness of teaching with technology. Regardless, are newfound metaphors even needed? Exchanging ladders for pools doesn’t change the fact that effective teaching requires different tools and tactics at different times. Nor does it change the fact that substitution and/or augmentation may just be what students need when certain valid and appropriate learning goals require technology’s use.2 Furthermore, if Education 3.0 does call for an increase in student directed learning, teachers need not (read: should not) function wholly within the Modification and Redefinition domains to successfully shift pedagogy. To do so would be terribly ineffective. As long as teachers exist to shepherd students in their pursuit of learning, (lowly substitution and augmentation) scaffolding techniques will continue to be essential. In the end, I can’t fault people for trying. Shoving SAMR down throats seems a bit extreme, but people do strange things when the future’s on the line. Our need for an appropriate way to measure the quality of the instructional use of technology is real. Mere usage statistics and ISTE rubrics don’t cut it. Because budgets are tight, priorities vary, and the politics of education demand accountability, I’m hopeful that people smarter than me can figure this out soon!